Bhut jolokia is having a moment in the spotlight, though you may know it better by its stage name: ghost pepper. Spicy food consumption is on the rise worldwide, and with it comes an appetite for even hotter peppers. 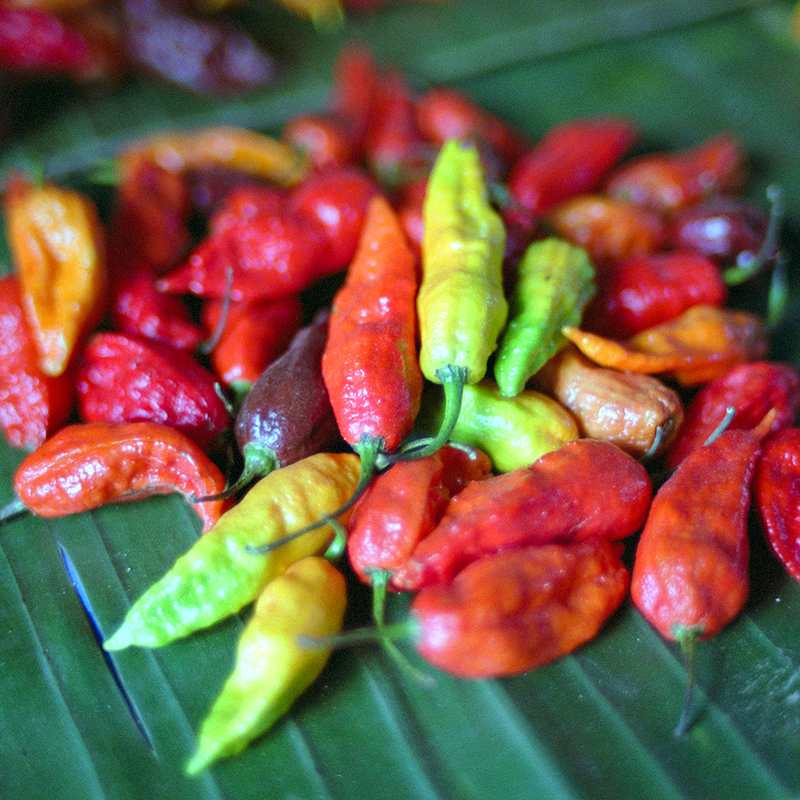 Luckily ghost peppers got just ahead of the curve, beating out the likes of those puny habaneros and Scotch bonnets in 2007 when Guinness gave bhut jolokia the title of hottest chili pepper on the planet, making it one of the first of what are known by spicy food enthusiasts as the "superhots." With these spicy little numbers popping up everywhere (even at your local Wendy's drive-thru), here's what you need to know about ghost peppers. Bhut jolokia is a small chili typically of a red or orange color and can have bumpy or smooth skin. The peppers are about 2.5-3.5 inches long and 1 inch wide, about the size of your thumb. They are a thinner-skinned than may chili peppers, and (unlike jalapeños) contain only half of their capsaicin (the spicy stuff) in the vein or pith and the other half in the actual flesh of the fruit. That means there's no escaping the heat when cooking with these bad boys. How Spicy is Ghost Pepper? Chili peppers' spiciness is rated in Scoville heat units (SHUs). For reference, a bell pepper rates a zero, Tabasco sauce is 2,500-5,000 SHUs, a jalapeño is 3,500-10,000 SHUs, and various habaneros come in at around 100k-350k SHUs. Until the 1980s it was widely accepted that the hottest peppers topped out at about half a million, then along came the bhut jolokia at 1,000,000+ SHUs. It was officially verified and crowned the hottest pepper by Guinness in 2007, and held that title until 2011 when a few more peppers like the slightly hotter Infinity chili and the current record holder the Carolina Reaper (up to 2 million SHUs) came onto the scene. What do Ghost Peppers Taste Like? Beyond being really hot, ghost peppers taste like a lot of other peppers you may have tried, though it seems many chili fans prefer the actual taste of the bhut jolokia to others. In a discussion on Reddit, one commenter claims they have a smokier flavor and others second the notion that habaneros apparently taste like garbage. Bhut jolokia originally hails from India, where's it's grown in the states of Assam, Nagaland, Manipur and Arunachal Pradesh. However the increasing worldwide interest in superhots has meant that universities and farmers in many regions have taken to growing ghost peppers for medical research, casual interest, and to make big bucks selling them to anyone who thinks they can stand the heat. Ghost peppers are now widely available in spice shops and at some farmers markets. Very carefully. But seriously, the bhut jolokia is used as a weapon in pepper sprays, grenades, and a repellent to keep elephants away from villages. It's used in curries, pickling brine and chutneys and has made its way into Western hot sauces and cuisines and even candy! Of course given its intense heat, the ghost pepper is also a staple of eating contests and drunken dares everywhere.